3 Hours CE Only $30! 2 Hours CE Only $20! Offers valid on future orders only. Have a coupon? Apply it at checkout for additional savings! Hurry, sale ends August 26, 2018. Professional Development Resources is a nonprofit educational corporation 501(c)(3) organized in 1992. We are approved to sponsor continuing education by the American Psychological Association (APA); the National Board of Certified Counselors (NBCC); the Association of Social Work Boards (ASWB); the American Occupational Therapy Association (AOTA); the American Speech-Language-Hearing Association (ASHA); the Commission on Dietetic Registration (CDR); the Alabama State Board of Occupational Therapy; the Florida Boards of Social Work, Mental Health Counseling and Marriage and Family Therapy, Psychology & School Psychology, Dietetics & Nutrition, Speech-Language Pathology and Audiology, and Occupational Therapy Practice; the New York State Education Department’s State Board for Mental Health Practitioners; the Ohio Counselor, Social Worker & MFT Board and Board of Speech-Language Pathology and Audiology; the South Carolina Board of Professional Counselors & MFTs; the Texas Board of Examiners of Marriage & Family Therapists and State Board of Social Worker Examiners; and we are CE Broker compliant (all courses are reported within a few days of completion). 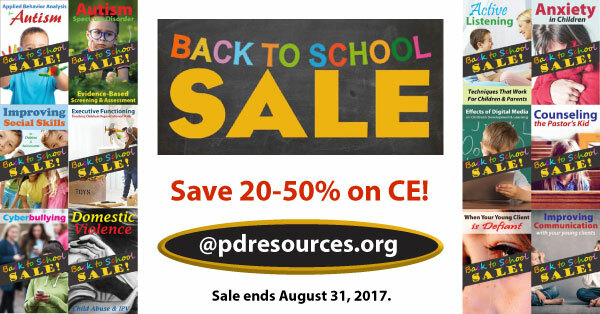 Back to School CE Sale Ends Sunday! 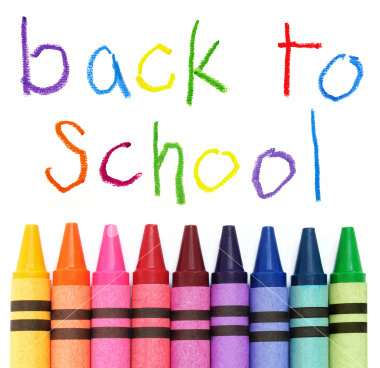 Only 3 days left to save on continuing education (CE) courses in our Back to School Sale! 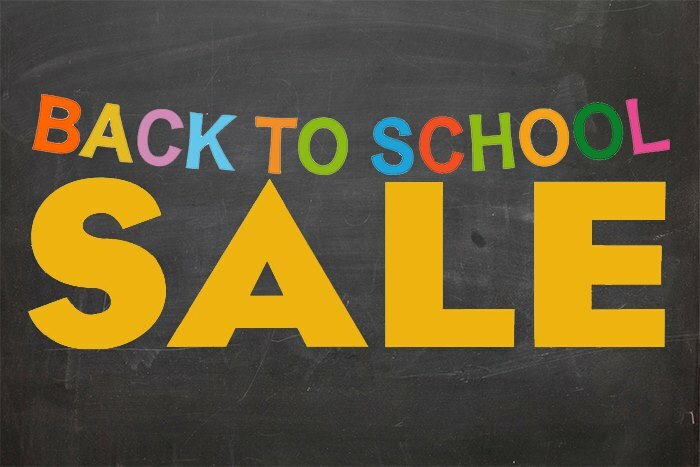 Save 15% on CE with our Back to School Sale! 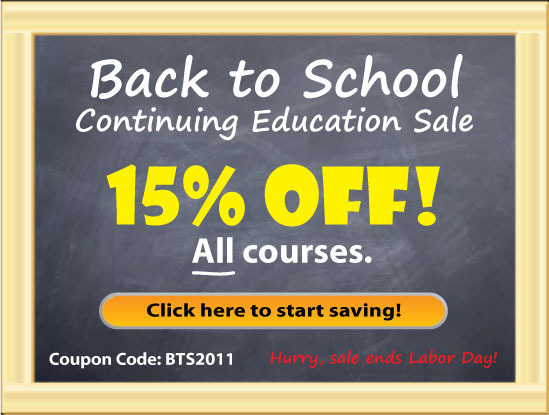 Save 15% on continuing education (CE) during our Back to School Sale! Enter coupon code BTS2011 during checkout to apply discount. Valid on future orders only (coupon cannot be applied retroactively). Hurry, sale ends September 5, 2011! With so many health care professionals working with children, in or out of school, we’ve grouped our school-based continuing education courses for easier browsing. Click here to browse courses with children in mind.